As with seemingly every President in the past few decades, when President Trump was elected, he promised to reform the tax code. The reason it’s always promised, but never delivered on is because every part of the tax code has people who lobby in favor of it. For example, getting rid of the interest tax deduction for mortgages would hurt the home builders and the banks because less people would be able to afford to buy a house. Another change which has been discussed is the border adjusted tax. That plan effectively is a tax on consumption which would also negatively affect the consumer. The consumer living off borrowed money is a temporary illusion of wealth, but real wealth growth comes from saving, not debt accumulation for most consumers. This illusion ends up wearing off when people retire with little savings and need to rely on the government. Entitlement spending is the biggest driver of the debt. But as we pointed out previously, relying on government benefits like social security is not a good idea towards living prosperously in retirement. If consumers were encouraged to save more, it wouldn’t be as big of an issue to raise the retirement age to help the government lower deficits. The key point needed to be reinforced is the tax code is like a wobbly Jenga game. If you try to take a piece out, the tower falls. If a boarder adjusted tax is proposed, retailers will lobby, complaining their business would be hurt by this change, rightfully so. It’s easy to cut taxes on the middle class or raise them on the rich; however, the complex nature of the tax code, which causes a hassle to most Americans, always stays. As was mentioned, Trump had several promises on taxes during the campaign. He wanted to lower the rates, lower the number of brackets, and simplify the code. For corporations, he wanted to lower the tax rates and get rid of deductions. During many Republican campaigns, candidates claim that you should be able to fill out your taxes on a napkin. This is an oversimplification of the point which is that they want to lower the number of deductions. It would be a good idea to simplify it to better keep track of taxes. The IRS could shrink in size. The problem is politicians talk about how great the plan is without getting to the specific deductions which would be eliminated. It’s tough to run on a platform that takes away deductions, but making the pain points palatable to the voters by explaining the benefits is the only way this problem will be solved. Until you see a politician discuss why he/she wants to get rid of certain deductions, radical reform won’t happen. In other words, the chances are slim to none. Another issue which is discussed in Republican circles is that the American corporate tax rate is too high. However, most corporations don’t pay the 35% statutory rate. Some actually pay a higher rate at times, but overall, most pay a lower rate. 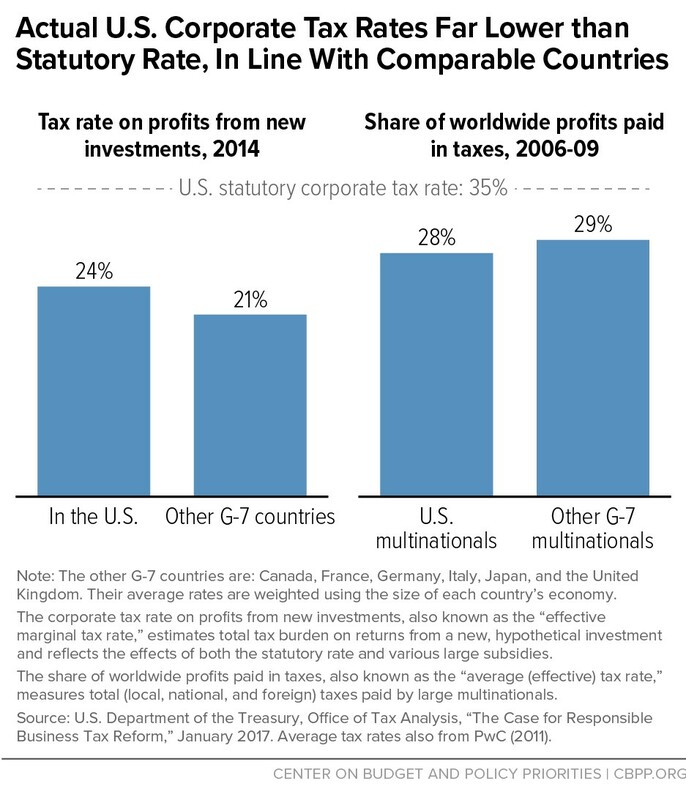 As you can see below, the effective corporate tax rates paid by U.S. firms is similar to comparable countries. If deductions are removed and the rate is lowered slightly, there wouldn’t be a difference in the money changing hands from the private sector to the government. Simplifying the code makes sense, but the chart below ruins the narrative that American businesses are being strangled. The way some businesses are hurt is if their competitors get subsidies or if regulations are stringent. The goal of this point isn’t to go after Republicans; we’re going over the truth about how the statutory tax rate is misused by politicians. Often “progressives” claim the tax rate on the rich should be 91%, as was the case under President Eisenhower. They conclude it’s a good idea to try something similar today. They mix up the marginal tax rate with the effective tax rate. The marginal tax rate is a political football often used when determining what certain income groups ‘deserve’ to pay. However, implying the taxes paid by the rich were 91% is not a fair point. 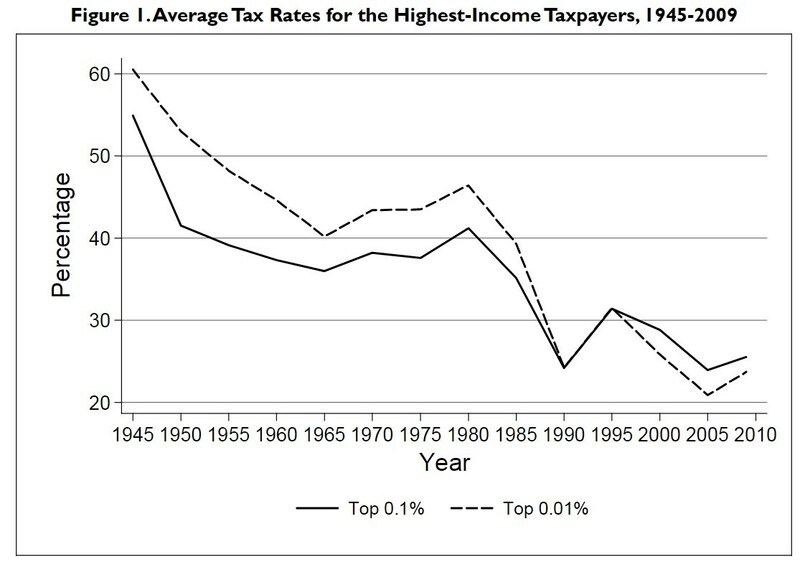 The chart below shows the tax rate paid during the Eisenhower’s presidency from 1953 to 1961 was in the upper 30s for the top 0.1% and the mid-40s for the top 0.01%. The tax rates have gone down in the past few decades, but not by the same amount progressives claim. While reforming the tax code will be tough, the one glimmer of hope for the GOP is the repatriation tax holiday. That’s when the capital US companies have overseas can be brought back to the US at a temporarily lower rate than the statutory corporate tax rate. It’s a politically feasible option because it increases revenues since no taxes were being paid on the money overseas, it lowers tax rates which fiscal conservatives like, and the money is brought back to the US which can theoretically be used to invest in production, creating jobs. In 2004, this was tried with the overseas money that was brought back to the US taxed at 5.25% instead of the usual 35%. Over $300 billion was brought back to the US in repatriated earnings, but the money went to stock buybacks instead of new investments despite incentives against doing that. 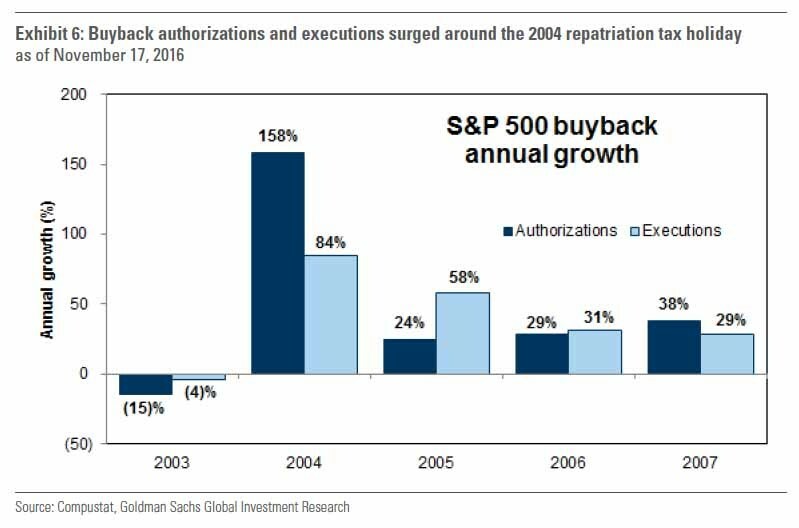 As you can see from the chart, buyback authorizations increased 158% in 2004. Stock buybacks are great for equity shareholders, but they harm small businesses. Buybacks from improved capital flows create an indirect form of growth as shareholders become richer. Shareholders can take that wealth and invest it somewhere else. In some of our articles, we talk about the perils of buybacks, but that’s in reference to firms taking out leverage to buy back shares. This flow of capital isn’t a bad thing; however, the point is politicians weren’t happy. Politicians wanted to get corporations to use their money one way, but they had other ideas. As you can see from the chart, the firms repatriating money didn’t hire new workers. One of the potential reasons why they may not have is because it’s difficult to spend a giant inflow of capital which comes all at once. Primarily however it revolves around short-term versus long-term benefits. Buying back stocks and artificially increasing the value of equity in the short-term creates a greater benefit than investing in the long-term. Given that most executives are compensated in the form of stock options, this makes the decision a no brainer. Why risk investing in the business itself where you may or may not see long-term growth, or increase the value of equity in the short-term? The improvement in capital may have helped some firms make strategic investments, but firms can’t just randomly dump money unnecessarily into R&D or expansion, especially if they see no room for growth with their current business models. Currently, there is about $2.6 trillion overseas. Unfortunately for politicians, the results of the next repatriation holiday will be worse. That’s because firms are borrowing money against their overseas capital to move it back home. The chart below is the BBB corporate bond yield. Borrowing costs have fallen, making issuing debt easier. In 2004, the BBB yield was about 4%, making a 5.25% repatriation tax reasonable to pay. Now the BBB yield is about 3% and the repatriation holiday Trump mentioned was 10%. The numbers don’t add up. Not as much capital will come back. Everyone talks about Apple’s $260 billion in cash and it’s $230 billion in cash overseas, but no one mentions its $108 billion in long-term debt. Apple’s debt has a 2.39% yield. Most of their cash will stay overseas as it’s cheaper to borrow against it than pay the tax. Hopefully, we dispelled any myths you have about the tax code. The goal is to educate you on the truth in an unbiased way. Now that you know what is happening, you will be one step closer to predicting the outcomes. For investors it’s important to know, a repatriation tax cut to 10% wouldn’t boost buybacks as much as last time (as a percentage of the total cash overseas). PreviousIs The Consumer Credit Cycle Turning? NextCost of Debt Vs. Cost of Equity: What’s Driving Markets?